While we often talk about the various chiropractic treatments we offer — writing blogs about cold laser therapy, Kinesio taping, and cryotherapy — it’s not just the treatments that bring people into our chiropractic office. While we love to tell you about the variety that we can offer, we’d also like to help you choose the right chiropractor. 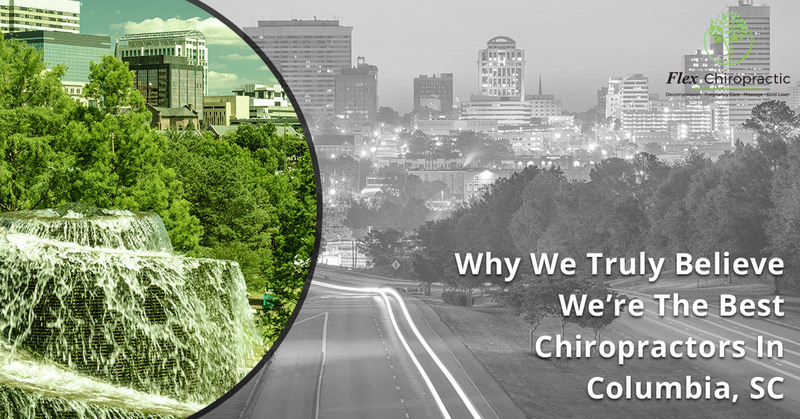 In fact, we’d like to help you find the best chiropractor in Columbia, SC. At Flex Chiropractic, we think you deserve the best chiropractic treatments available. That’s why we have spent so much time and effort assembling the necessary pieces to deliver an excellent chiropractic experience to anyone who walks through our doors. Let’s take a look at what you can expect. At Flex Chiropractic, we have two doctors on staff in order to provide the ultimate in chiropractic care. And that’s kind of a big deal, because not every chiropractor is actually a doctor, so you have to be careful when choosing a chiropractic clinic. Here’s a bit more information about the two doctors we have here at Flex. Dr. Angela Larson got her Doctor of Chiropractic license from Northwestern Health Sciences University in Bloomington, Minnesota. Before that, she attended Michigan State University and graduated with a BS in Human Biology. Dr. Felicia Danio is a graduate of Palmer College of Chiropractic and is board-certified as a Doctor of Chiropractic. She has her bachelor’s degree in Community Health from Florida Gulf Coast University. We know that a patient’s interactions aren’t just with the doctors themselves. That’s why we’ve assembled the best staff possible, whether they’re working as an office manager, masseuse, rehab specialist, or in any other capacity. No matter what service you’re here for, you’re sure to be comfortable working with our staff. As we discussed before, we’re often writing about the many treatment options you’ll find at our Columbia chiropractic office. We offer the latest and greatest chiropractic methods available, including traditional chiropractic adjustments, decompression, and use of Pro Adjusters. We also have massage therapy and kinesiology taping in order to help muscles. On top of that, we have the latest in high-tech equipment so that we can offer cold-laser therapy, electrical stimulation, and ultrasound therapy. Having all of these under one roof means that you’ll be able to experience the different types of relief they offer without having to run all over town. When the doctor takes a look at x-rays or does a physical examination, she can come up with a perfect combination of treatments that can give a patient relief in the shortest possible time. We know that people need to be comfortable when working with a local chiropractor, and that’s why we have a very comfortable facility at 1811 Bull St. You’ll feel right at home when you meet our staff and wait in the waiting room. The truth is, all chiropractic clinics are not the same. In fact, there are a few that we certainly wouldn’t recommend to you based on their reputation. We’re not going to name them directly, but we’re sure that a few searches for “chiropractor near me” will bring up some negative reviews for some of them. When you search for the Columbia branch of Flex Chiropractic, you’re going to find some amazing Google reviews. As we write this, we have a 4.9 out of 5, which makes us pretty sure we’re doing something right! That number alone makes us pretty sure we’re the best chiropractors in Columbia, but we hope you’ll find for yourself. We want to help as many people in Columbia as possible get the chiropractic care they need. While there are many good (and not-so-good) chiropractors around, we like to think that we’re the best chiropractors around. If you’re ready to get the most advanced chiropractic care around, contact Flex Chiropractic today!